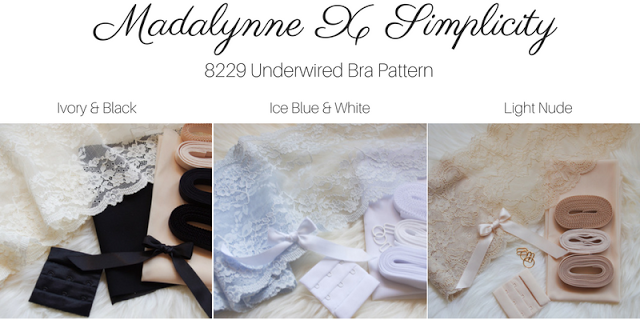 Home / Blog / Madalynne X Simplicity: Review & Kits! There’s nothing that I love more than supporting other wonderful women in my favourite industry 🙂 except maybe bras, and sewing bras. Which works out perfectly for this! I thought I would try my hand at each pattern so I made the underwired bra from 8229, and the View A Halter bralette from 8228, because it really jumped out at me as a gap in my lingerie wardrobe! I first made the 8229 underwired bra pattern. My measurements are 30″ underbust and 37.5″ full bust, which put me in a 34 band, and right on the tipping point between a C cup and a D cup. Since I usually wear a 34D, and that is the underwire size I fit I decided to go with a 34D- the fit was pretty close, but I could have used a tiny bit more room in the cup- so if you’re wavering between sizes, I would opt larger- especially if you’re using powernet for a lining! The bra came together super quick- and there were only a couple tiny adjustments I made to the pattern, which included: narrowing the bridge by 1/4″, swapping out 1/2″ straps for the 3/8″ recommended, and attaching the straps to the bottom and top of the back band (for a little extra structure). Oh and a bow- I added a big bow! I used my latte powernet, elastics and channelling to line the lace cups & frame, but then I used black elastics and powernet for the rest to really pop! I really like the shape of this bra and overall look, and it was fun to have a chance to try out someone else’s pattern and style for a change! Next, I made the View A Halter bralette from 8228. This pattern immediately stuck out to me- I think this would be so gorgeous showing under a sheer shirt! I made a 34D, same as the other bra, and I think it could also use a tiny bit of extra room, but I do have to say that it makes me look pretty boobalicious in this size! This bralette pattern also came together really quick and the only adjustment I made to the pattern was to lengthen the halter- I added about 1.5″ to where it joins at the back of the neck since I am quite a tall long-bodied person. I think this pattern is really perfect for showing off a stunning lace- and it definitely gets your lace placement skills boosted! Normally I get tons of requests from people who want to make the exact bras that I post- but I don’t have the patterns available (yet!) But today I’m so excited that I get to say: YES! you can make exactly what I just made!! And with a couple colour options too!! These are limited editions kits that I’ve come out with just for this collaboration! Limited Edition Kits Available on my Etsy! This was such a fun project (Gibby was quite happy with the fireside photo shoot too!!) And I’m always so inspired by our amazing bra making community and the amazing ladies (and gentlemen!) who make it awesome!Have you sewn the MadalynneXSimplicity patterns yet? How was your experience? Gorgeous! 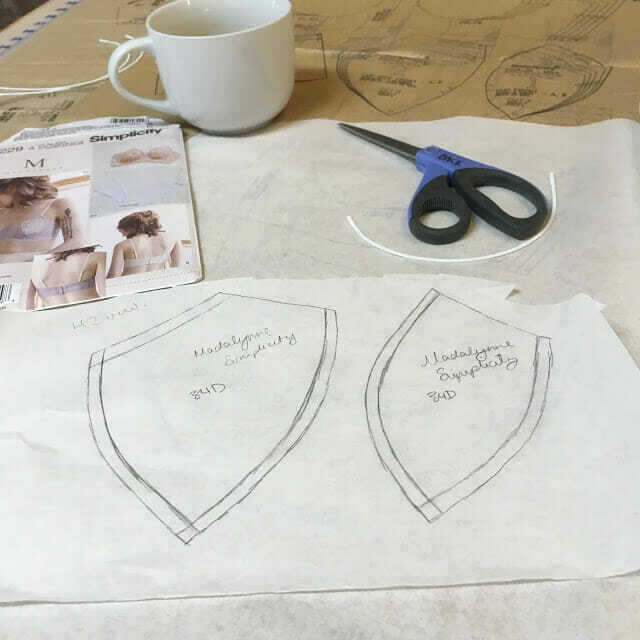 I know you on pattern review and follow you on Instagram and but am only just seeing your blog thanks to the article link you sent me on etsy! What a great, informative and pretty blog! Just a quick question on the pattern that I just haven’t been able to figure out yet.. I know it’s not yours but you made such a sweet and well fitting bra so I hope you can answer it! What I can’t figure out is the seam allowance for the cups? And if it’s included in the pattern or not? Thanks so much, your blog is super inspiring! Beautiful makes and great pictures. You really have an eye for aesthetics. Wow Erin, both are so beautiful! I love both of them and the photo shoot too! Wish I could order a kit (or more) but shipping will kill me! Hope you get lots of orders. Oh I know- even myself I see what the other bra suppliers have and I'm so tempted!! And YAY we're breast buddies! Beautiful! What lovely results!! I've not ever been a fan of Madelynne bras, etc because they seem to only be cute and not supportive or have much function if you need support. How would you compare the level of support of the underwire one as compared to say Beverly's soft cup bras? What is the silhouette like under a regular top? Would you say the underwire one would be functional for everyday wear for the gal who needs decent support (oddly enough I'm smaller busted, but need lots of support!) Thanks!! Hi Kathy! I totally understand you- Madalynne's style is definitely geared towards the smaller and self-supporting chests! As far as this bra goes, I think it really comes down to the fabrics that you use. If you make it with something really stretchy then you're not going to get much benefit, but if you use something non-stretch (and go up a cup size or two to accommodate) then you will probably get some good support. Along with this I would recommend to always use a non-stretch for your frame, at least at the bridge, for more support- not the recommended powernet. I found that using the powernet for lining the cups was fairly good support for me, since my breast tissue isn't very heavy and is self supporting ( the joys of being 25! with no kids). As far as the shape and the silhouette- I like the shape of this pattern more than the shape of the Pin-Up Girls pattern- it's much more youthful. But being a custom bra maker who makes this exact to their body- I definitely don't like this as much as my own style and shape that I draft into my bras. Realy love your black kit. Beautiful work! I am now thinking about a lacy black bra under a crisp white shirt. Off to look at your Easy page. Love your versions and combinations of material! Thanks!! I'm really feeling the neutrals lately! Wow, you did an amazing job! Both look like high-end lingerie. And I love how you've styled this shoot. It's beautiful and not at all scandalous. Thank you so much for putting together the kits! I have both of these patterns but have been too intimidated to get started. I'll purchase a kit from you when the time comes. Thanks Carmen! This shoot was so much fun, and really I just can't take myself seriously enough to do 'scandalous' photos lol.